Shakespeare was a rather good playwright. We tend to forget that amidst modern interpretations of the sort done by Kenneth Branagh or Joss Whedon. Trinity Rep a few years ago put on Hamlet as if it was an episode of Downton Abbey. One film version of Othello transfers the story to a high-school basketball court. Such theatrical conceits are common, almost de rigeur, but not at Mixed Magic Theatre who serve their Othello straight up in the classic mode. This style of performance may seem a bit bombastic to modern tastes attuned to the small television screen, but it is very close to what Shakespeare himself and his audiences saw 400 years ago. 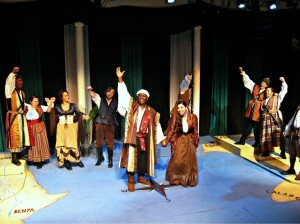 With a minimalist set consisting of little more than floorboards painted to look like a map — “Afrika” stage right, “Italia” stage left, and a compass rose dead center — a company of actors proceed to distill to its essence one of the best and most challenging plays in the Shakespearean repertoire, a tale of jealousy, revenge and prejudice. Ricardo Pitts-Wiley, the patriarch of a theatrical family that is the Rhode Island version of the Barrymores, gives one of the most physically demanding performances of the title role I’ve seen, a man driven mad by his own inner demons although with more than a slight push. At first a swaggering general, Pitts-Wiley’s Othello shrinks throughout the course of the play into a cowering and hesitant weakling, no small feat for an actor whose natural appearance is more the former than the latter. His Othello is not angsty or arrogant, but paranoid. Who can he trust? Such physicality of the performance can be genuinely unsettling. Desdemona’s final scene is not softened through stage artifice and is shown with all of the violence of the literal text, but in Pitts-Wiley’s hands this makes the contrasting involuntary tenderness of it even more horrifying. Consistent with modern perspective, Stephanie Crugnola plays Desdemona as passively and resignedly accepting whatever her fate may be, rather than as an unknowing innocent. Alex Duckworth as Iago is faced with one of the most challenging and loquacious roles in all of Shakespeare, a character whose fatal flaw is to equate justice with revenge and who believes he is in the right, no matter how evil his scheming and betrayals, because he has himself been wronged. There is something of a custom in recent decades to see Othello and Iago as twinned, or at least two sides of the same coin, sometimes even with a pair of actors alternating the roles throughout the run of performances, but here Duckworth, thin and serpentine, plays Iago more traditionally as the polar opposite of his boss. 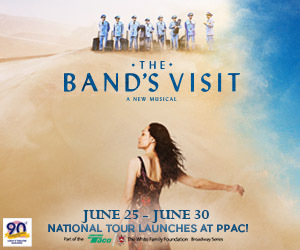 Particularly outstanding in supporting roles are Hannah Lum as Emilia (Iago’s wife), who comes to realize the shocking moral consequences of her own unknowing action, and Bob Colonna as Brabantio (Desdemona’s father), whose vast experience as founder of The Rhode Island Shakespeare Company (TRIST) more than 40 years ago gives him a commanding stage presence. Jordan Greeley as the framed Cassio, Christopher Ferreira as the hapless buffoon Roderigo, and Ottavia De Luca as Bianca round out the core cast. Mixed Magic’s Othello is a solid version especially well suited to the play-goer who has been turned off by the forced cleverness and gimmickry of hypermodern interpretations. I noted with some regret that there were more than a few seats available for the Saturday evening performance I attended; Pitts-Wiley’s well-acted interpretation is well worth seeing. Othello at Mixed Magic Theatre, 999 Main St Unit 115, Pawtucket, RI 02860, 401-305-7333 http://mmtri.com/2013/11/01/othello/, Fri (Dec 6, 13) and Sat (Dec 7, 14) at 7:30pm, Sun (Dec 8, 15) at 3:00pm.